The Cube U18GT Dual-core Elite verison is a wonderful tablet PC, which adopts Android 4.0 OS, and is powered by Rockchip RK3066 Cortex-A9 dual-core 1.6GHz, Quad-core GPU and 1GB DDR3 RAM to ensure its running more stably. 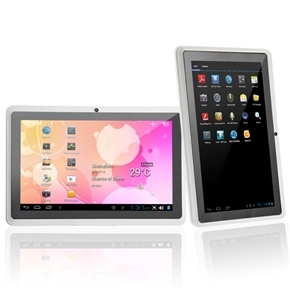 7-inch 1024*600 pixels capacitive 5-poin touch screen will make your operation more conveniently. It supports WiFi, external 3G and Ethernet networks for surfing internet. With a HDMI output, you can transfer the interesting videos in the tablet to your HD TV and share them with your families and friends. Besides, it has a 0.3MP front camera for self capturing and enjoying online video chat. Other Applications Browser, UC browser, Clock, Calendar, Calculator, File manager, Gallery, Flash player, iReader, Email, Gmail, etc. Customer Rating: 1 customers would recommend this product to their friends. Agree with them, or you have different ideas? Write your comments. The Cube U18GT Dual-core Elite is a wonderful tablet PC, which adopts Android 4.0 OS, and is powered by Rockchip RK3066 Cortex-A9 dual-core 1.6GHz, Quad-core GPU and 1GB DDR3 RAM to ensure its running more stably.